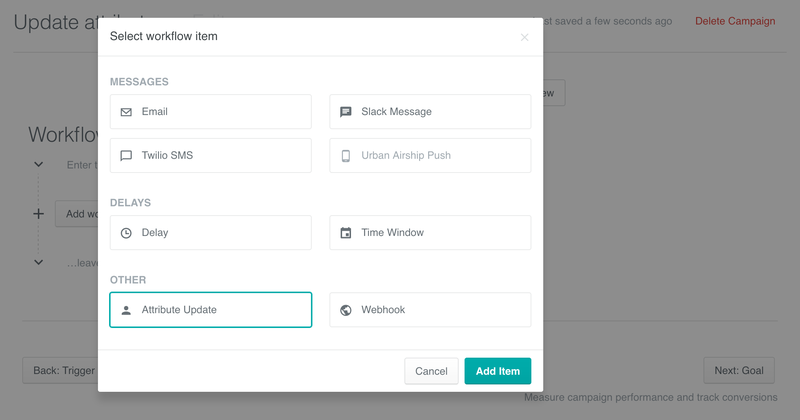 The Attribute Update action allows you to create, modify, or remove a customer&apos;s attribute as they move through a campaign. ...and we&apos;re sure there are more we haven&apos;t uncovered yet! Once you add it, give the Attribute Update action a name that best describes what it does - for example, "Updating account anniversary." In the Attribute Name field of the composer, choose your attribute. Or, if you&apos;re setting a new one that doesn&apos;t exist yet, simply enter it into the field. This updates a customer&apos;s anniversary from November 18, 2016 to November 18, 2017 (adding 365 days). We can do this using Liquid and timestamps. Note that setting an attribute to blank will remove it. Save your Attribute Update action, and continue setting up your campaign! If you&apos;ve found a cool use case for the attribute action or you need some help setting it up, just get in touch and we&apos;ll be happy to help. In this example, when a customer performs a `purchased` event, the price of the product is added to their purchase total. However, we need to check if `customer.purchase_total` exists first— otherwise, the attribute update (and calculation) will fail. If it doesn&apos;t exist, it will be set to the price of this first purchase. Does this create new attributes, too? What if it doesn&apos;t exist? Yes! If an attribute doesn&apos;t exist for a customer and they enter this action in the workflow, that attribute will be set for them. Can I use Liquid in attribute names? Not just yet. You can use Liquid in the attribute value, but not in the name—if you feel you need to do this, let us know. We&apos;d love more information on your particular use case. Can I modify multiple attributes in one action? Unfortunately not; each action only modifies one attribute.